Composer Katy Abbott introduces two of her choral works: Crime Scene Investigation, commissioned by MLC School (Sydney) for their 2005 Sydney Opera House concert, and Aspects of Dreaming, commissioned by Stephen Leek and The Australian Voices who premiered the work in early 2007 in Queensland. You are now a suspect in a murder investigation. The leader of the orchestra - the first violinist - has just been murdered as she swept off the stage, never to return for her encore. Please remain seated while the evidence is collected and analysed. Crime Scene Investigation was commissioned by MLC School (Sydney) for their 2005 Sydney Opera House concert 'Flights of Fantasy'. The audience inadvertently found themselves prime suspects at a crime scene. The terms 'mystery' and 'fantasy' conjure up all sorts of evocative imagery: goblins and forests, moody sound-worlds and space adventure. I like to keep things more local and in real time. At the time of writing the piece, the television programmers were presenting a fairly constant array of murder mystery and crime programs, such as Crime Scene Investigation (Las Vegas, NY and Miami) and other shows such as Criminal Intent and NCIS. My twins were one year old, and in order to escape the busyness of the daytime, and keep awake in the early evening, my lovely husband became addicted to Crime Scene Investigation. Unfortunately, he would fall asleep 45 minutes into the program and wake up five minutes after the end. As a dutiful wife, I would relay the plot and of course describe the bloodied evidence that led to the murderer and the arrest of the culprit. Having a brain that was quite befuddled in newfound parenthood, composing a spoof of such a TV program appealed and seemed to fit into the 'fantasy' aspect of the Sydney Opera House concert. I derived a perverse pleasure from imagining a girls' choir singing about being 'shot dead in the head' in the most polite tones. Scored for narrator, SSA choir, string orchestra and percussion, the music leads the audience through the story in which the first violinist is gruesomely killed and the performers and audience become suspects in the investigation. New evidence in the form of 'a long hair' comes to light. This evidence is analysed and eventually turns out to be horse hair from a bow of a stringed instrument. All the crime scene investigator needs to do is determine the length of hair from the bow, and match it to a violin, viola, cello or double bass bow. The murderer is being cornered. As it transpires, the hair came not only from a double bass bow but from the double bass bow belonging to a percussionist who just 'happens' to be bowing the vibraphone, and thus, after eight musical minutes of investigation, the mystery is solved. I wanted to compose something contemporary and fun. Knowing how well rehearsed the ensemble would be, I wrote music that would engage the singers and challenge them to sing it 'as if it was the first time they heard the story'. Aspects of the choral writing include storytelling in a canon, sweetly singing about gunshots and bloody evidence, narrating the story dripping with cynicism, similar to the arrogance of those TV investigators who frequent my living room. The sound world includes a 'freely chromatic' pizzicato string opening, conjuring imagery of tip-toeing, Sondheim-esque storytelling through polyphonic melodic superimposition, and, as mentioned before, the sweet sound of treble voices espousing upon the grisly mode of death. See Music example 1 below. Music example 1 (click to enlarge): Crime Scene Investigation, bars 108 - 113. Although the poem by the Chinese poet Li Po was penned more than 1000 years ago, the mood it conjures can be related to by many today. We have all experienced the isolated (or comforting) feeling of being the only one awake in the small hours of the night, alone with our thoughts. The person talking in the poem is also away from their home. Aspects of Dreaming was begun during the first hot day of the summer 2006-07 - the hottest October day for 50 years in Victoria. This event and subsequent bushfires helped fuel the 'water/drought' debate, and I imagined the person in the poem as an Australian farmer, thinking of his home, and thinking of, and hoping for, rain. Aspects of Dreaming is about hope. The title refers to the dream-like state, induced by the farmer's thoughts and his hopes of rain, hearing rain on the roof, unknowing if he is asleep or awake, and if the rain is real or imagined. The opening offers optional solos in all four voice parts. They interweave freely, allowing the vocalists some interpretation within the fluidity of the melody. Overlapping occurs between the solos, creating an ambient ensemble effect, and modulation occurs through the use of a single pitch to segue to the next phrase. The use of pedal point in this context is an important feature of the work, and I have since used this (not uncommon) idea in other pieces, in both vocal and instrumental scenarios, as a feature of the harmonic development. The opening phrases (also utilised in the improvisation sections) have become part of me. If I catch myself absent-mindedly humming (which occurs a good proportion of the time), these are the phrases I sing. Even though I don't normally open a piece with wordless song, this time, with the raw solo voice, these phrases are enough for me. The work is centred around a single moment in time (at night), and so I needed to try and capture the stillness of that moment without neglecting important musical elements of development and drive. 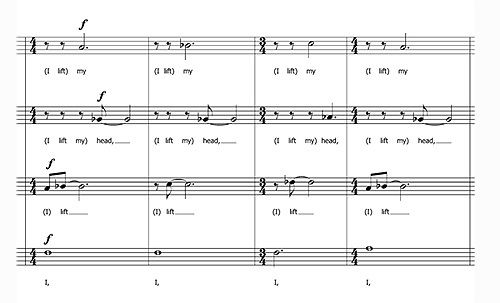 Aspects of the vocal 'orchestration' include dividing the one melodic phrase between the four vocal lines (see Music example 2 below), unison and octave unison, and voices singing 'out of phrase' which produced a haunting and shimmering effect. There are two semi-improvised sections where singers are given the same melodic phrase and asked to individually improvise the tempi. This results in a beautiful and haunting sound, reminiscent of the moon, and being alone, away from home, with longing. Further into the piece, the singers are asked to create the sense of rain falling on a tin roof - a very comforting Australian sound to me (see Music example 3 below). The music begins slowly and irregularly, gradually building into a steady rhythm. The singers' lines are designed to be heard as one, but also individually. When I hear rain on a tin roof, I can hear each individual drop, and also the whole effect. The structure of Aspects of Dreaming is not complex. The difficulty of the piece, as always, is the challenge for the ensemble to listen to each other and create one whole piece of music from their own individual lines. The lines are designed to be heard as one, and the beauty of choral music (as in any orchestral music) is to hear the 'whole' from the parts. Katy Abbott Katy Abbott has produced a range of orchestra, vocal/choral and chamber music, including her symphony Souls of Fire - recently recorded by Kiev Philharmonic Orchestra. Katy is also Mum to three young boys and is happily ensconced back in Melbourne after living away in Malaysia and Dubai for a time. Her new large work for orchestra, The Peasant Prince was commissioned and performed by the Adelaide Symphony Orchestra earlier in 2009, and she is currently working on a new piece for solo bassoon, MultiSonics. Katy teaches graduate composition at University of Melbourne.